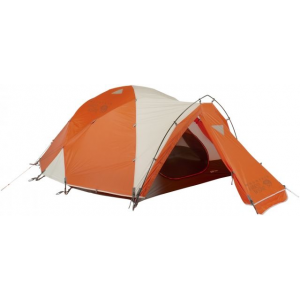 Beautifully constructed, sturdy, awesome roomy tent. This tent is hands down amazing. With two tall adults, a dog, and a ton of gear, there's still tons of space. Sturdy as hell — this thing takes wind storms in stride. Easy and quick to assemble and tear down. The vestibule makes the conversion from 3-season to 4-season seamless. Every time I go out with this tent, I smile. Definitely money well spent. Be sure to purchase the ground sheet. Welcome to Trailspace, Shane. Thanks for sharing a review of your MH tent. How long have you had yours and what kind of conditions do you use it in? It would be great to see some pictures of your tent in use too. Setup: Easy setup, poles are intuitive, and the rain fly attaches easily to the tent body. I did make a small mark on the front door, to differentiate it from the rear. This makes a difference when matching up the window in the rain fly with the vent in the tent body. Stability: Rock solid in the worst conditions. Weather resistance: Vents moisture well, mild condensation in very wet conditions. The vestibule does not go all the way down to the ground, so blowing snow into the vestibule can be an issue. Room/Storage: Plenty of room for three people and gear, excellent room in both front and rear vestibules. Packability: Big and heavy, but expected for the amount of room it provides. Ease of use: excellent materials and easy to handle. Features: I really like the internal pockets, and bought a gear loft as well (very handy). The clips for attaching the tent body are much easier than sleeves to deal with. Clear window in front vestibule is nice for checking weather conditions without getting out. Construction/Durability: The PU coating on the underside of the rain fly seems to be degrading faster than other tents that I've had. It has become somewhat sticky, but I have used the tent for ~40 days in a variety of conditions. Conditions: I have owned this tent for 6 years and used it ~40 days for mostly winter camping and mountaineering. It has easily handled 50+ mph winds for 24 hours, with no pole bending or cracking. Amazing tent, easy to build. I took it to some volcano aproach climbing Lanin in Patagonia near Alumine. It holds fantastic to the constant wind and holds very well in a fast but strong storm, roomy and reliable. A bit more weight to carry, but worth it!! Looking forward to take it to Peru mountains on January, Cordillera Blanca. This is a great tent if you want something this big. This is a great tent if you want something this big. I was looking for a good 4 season 2 man tent and had heard that this had just the right amount of room for 2 plus gear. Well that was a little bit of an understatement. 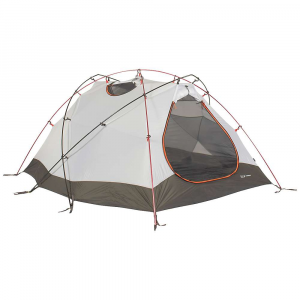 This 3 person tent is great for 3 people. If you compare it to the 2 person tent the room inside and the packed size is quite noticeable. I think the 3 man would actually be colder cause of all the extra room for the dead air in the tent. So I ended up returning the 3 man for the 2 man and the smaller one was just right for me and the wife. Everything else with regards to this tent is spot on with what others say about the MH Trango. It's easy to set up, very sturdy, and extremely bomber. Getting the footprint makes cinching the rainfly better and more secure. Plus, this tent just looks freakin' sweet. I leave in eastern Canada and I use my tent 30 to 40 days per year, mostly during the months of August and September. It often rains and the climate is very humid and windy. The temperature can reach 80 during the day and 40 during the night. We use it for trekking expedition and sea kayaking. 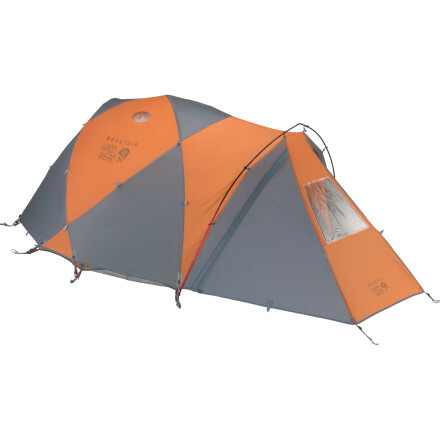 The TRANGO 3.1 is waterproof, solid, roomy and very comfortable. Thanks to Mountain Hardwear for this quality product. A big roomy tent, with lots of little storage pockets. A big roomy tent, with lots of little storage pockets. Mostly usable vestibules front and back. Factory replacement of broken poles has been excellent. A bit heavy for non-motorized travel. Ventilation needs improvement. Entrance and exit is not graceful. Doors are held open with figity little straps. Pretty darn comfy. There's a whole lot of room in the Trango and plenty of pockets to store stuff in. I searched for some time to find the best tent at this price and it came down to this or the Marmot Thor. Given the Easton poles in the Trango you get a bit more strength hence my decision. The tent is easy to erect and once it's up it isn't going anywhere. My only complaint, not unique to Mountain Hardwear is the hassle of seam sealing that you have to do when you get the tent new. Can't this be done in the factory?? Ease of Setup: Extemely easy. 4 poles (2 straight, 2 curved) plus a vestibule pole, all colour coordinated. The clip system is a lot easier to set up than sleeves (like TNF) and works really well, once you get a hang of the double clips used at the pole intersections. Weight: fairly heavy, approx. 9 1/2 lbs. 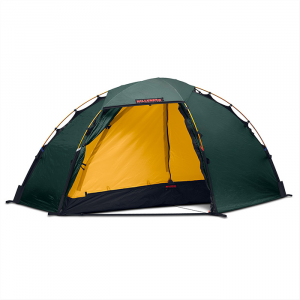 This is an incredible tent, well worth the $ and extra weight. I lived for an entire summer with my buddy in it while treeplanting in northern Alberta and have taken it backpacking on several occasions. It is easy to set up, virtually bomb-proof once standing and keeps everything (wind, rain, bugs) out completely. Despite its design to be a full bore expedition tent (you can see ed viesturs et al using them in the imax everest film) it remained comfortable during the summer months thanks to two massive doors on each side that offered flow-thru ventilation to keep it nice and cool. And when you zip those doors shut it retains its heat so well it easily kept me comfortable sleeping in it in the Canadian Rockies in December - February. All around, just an excellent tent. Three of us used this tent and two of us hated it. Three of us used this tent and two of us hated it. The two sleeping on the side of the tent. We couldn't sit up at all. The tent is just above your head. Trying to get out without being able to sit up is ridiculous. Very heavy, but it is a bomb-proof 4-season tent. Those two things usually go together. 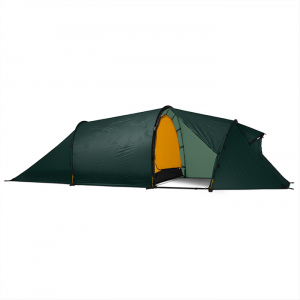 I think it is better to get a very light 3-season tent and use it all year around or if you like, buy a light Bibler for the winter too. If you happen to be the one sleeping in the center and don't mind being stepped on, you might like this tent.